Famous for its theme parks, attractions, killer whales and larger-than-life, big eared mice Orlando is the perfect destination for a great summer holiday. No matter who you are with, this city is going to bring out your inner child and sense of amazement. Whilst some people might tell you that Disney’s Magic Kingdom, SeaWorld or Universal Studio’s Wizarding World of Harry Potter are just for kids, they are most definitely incorrect. It does not matter what age you are the magic of these parks will amaze you. Where else are you going to make friends with a giant mouse and go on a rollercoaster in the same day? And can you think of anywhere else that you can meet wizards or see a killer whale perform? Whether you stay in the parks or just visit during the day you will have an absolute whale of a time! Outside of the theme parks Orlando has loads to offer. For anyone who has ever been fascinated by space and rockets, then a trip to the Kennedy Space Centre is an absolute must. Covering the history of space travel, the Apollo missions, seeing a rocket and mission control this engaging and enthralling museum will tell you everything about man’s adventures at the final frontier. 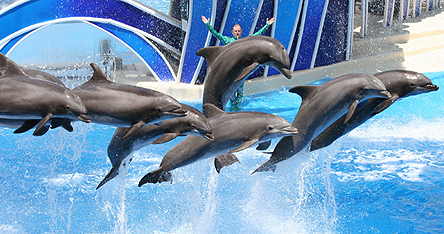 For those who are not looking for an out of this world experience Orlando can provide a fantastic range of activities. People who love to shop will find plenty of malls to visit and even a couple of big outlet malls where you are sure to get great clothes at incredible prices. Golfers can also soak up the summer sun on the courses just outside the city. When the sun goes down Orlando does anything but go to bed. From restaurants to bars, clubs and shows this happening city has it all. Each of the big resorts has its own entertainment – such as the Shamu Rocks at SeaWorld, or Cirque de Soleil in the Magic Kingdom – but there is also a lot on offer in downtown Orlando from 80s pop to country or indie music, where you’ll be mixing with the locals rather than the tourists. As you are in the south temperatures will get quite high in the summer. Typical temperatures from June to September vary, but do not usually get below 20°C and go up to about 30°C. August is usually the hottest month where temperatures can peak in the mid 30s. Remember to bear this in mind when making your plans and make sure to drink plenty – even if you are getting splashed at SeaWorld!